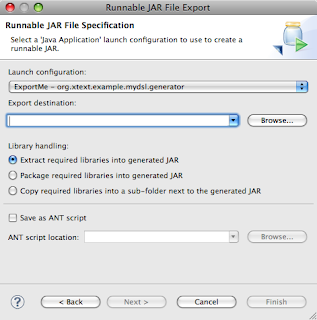 How to Deploy Xtext to a Headless Plain-Java Environment? Yesterday, Sven and I were at the Eclipse Democamp in Hannover which was organized by brox IT-Solutions and Bredex - thanks for the nice event. I met interesting people and we discussed various topics. 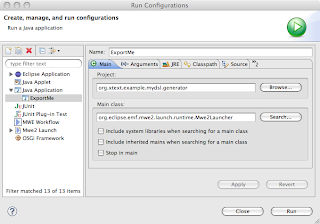 One particular question about Xtext was raised several times from different sides: How do I use my language in an environment without Eclipse, e.g. on a build server? As this was already possible from the first minute even with the former oAW version of Xtext and with Xtext 0.7.0, too, I was kind of suprised. 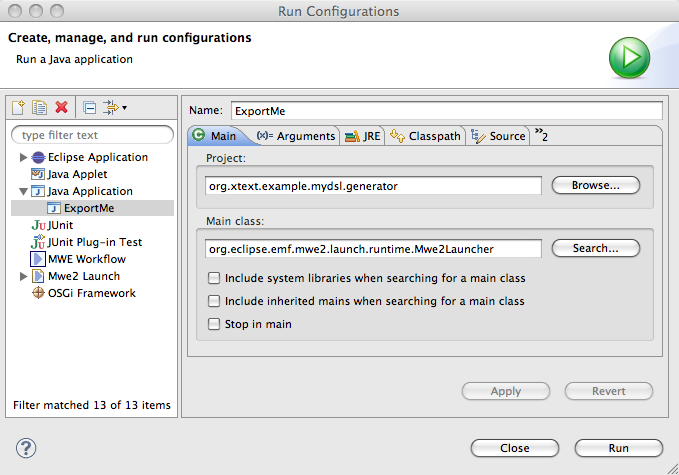 In fact, any execution of the generator workflow uses Xtext in a standalone environment - without OSGi, Equinox or any dependency on Eclipse UI. The problem seems to be another one: How can I determine all the required libraries to deploy my Xtext-driven generator? Select the options of your choice, point to a target file and hit the Finish-button. 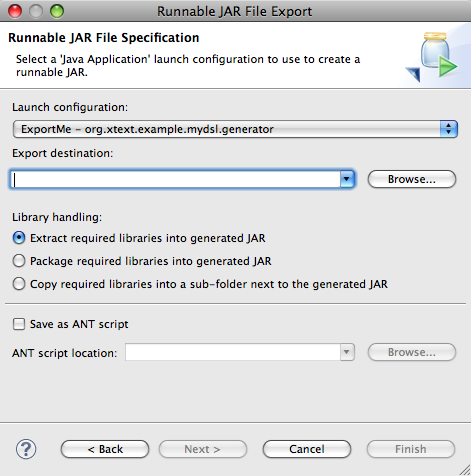 Eclipse will collect required libraries and add the necessary entries to the MANIFEST.MF in the runnable JAR file. As I already said, it's suprisingly simple. It's probably a good idea to wrap the invocation of the Mwe2Launcher in a custom main class to encapsulate the name of the generator workflow and pass additional arguments to the workflow. A quick glimpse at the New and Noteworthy features of Xtext 1.0 reveals that the framework allows to develop languages that are case insensitive. The o.e.x.g.parser.antlr.ex.rt.AntlrGeneratorFragment and o.e.x.g.parser.antlr.ex.ca.ContentAssistParserGeneratorFragment replace the two fragments, that are configured by default: o.e.x.g.parser.antlr.XtextAntlrGeneratorFragment and o.e.x.g.parser.antlr.XtextAntlrUiGeneratorFragment. Xtext provides an API that allows to define custom, local scopes that are ignore case as well. Have a look at the utility class o.e.x.resource.ignorecase.IgnoreCaseScopes to learn more about it. The configured generator fragments will take care of the rest, e.g. the default bindings for the global scopes, the parser and the serializer. As you can see it is possible to define case insensitivity independently for keywords and cross-links. And if you want to keep your workflow short and concise instead of adding this flag for each and every fragment that accepts this option, you are free to introduce a new property and use this one directly or via the auto-inject option. Please refer to the updated documentation if you want to learn more about the MWE2 language.